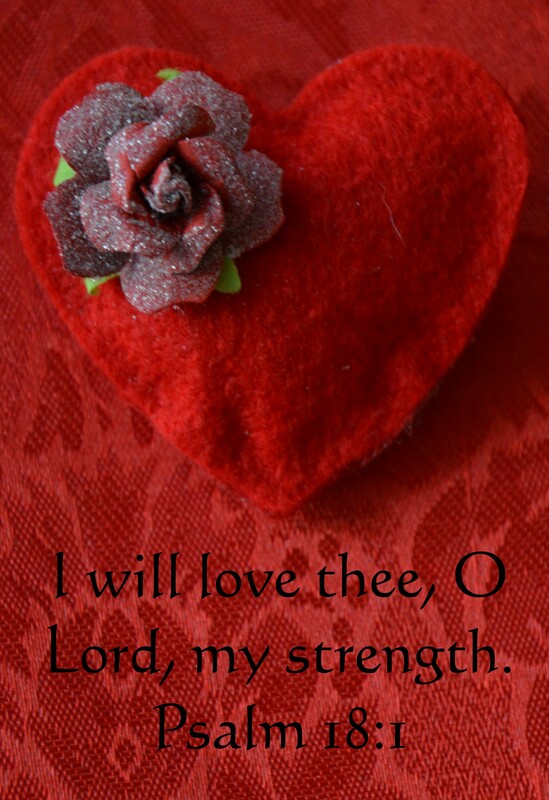 I do love you , O Lord, my strength. I could not live without you. Without the Lord I would find it hard to get up each day. My husband and I are fighting so many battles, I can hardly believe it myself how He is holding us through terrible challenges in our life. My husband has Giant Cell Arteritis. It is a rare disease. It is similar to arthritis, but it attacks the arteries. The treatment for that has caused Kidney disease. He has had a couple bad falls and has been in the hospital since thanksgiving. His injuries were so severe he has had to learn to stand and walk again. It breaks my heart to see him in this way. But he smiles and laughs and does the best he can..He is getting stronger everyday..He does two hours in the gym every morning. He can stand now and is walking with a walker. The Lord is his strength! I too have battles to fight as I try to spend everyday with him where he is . I’m tired, and fearful of what he is going through. Along with that I am still battling stage 4 cancer. I have been on Chemo now for 14 months, no breaks because my cancer is advanced. I can’t stop with the chemo or the cancer will figure the treatment out and morph its way around and get stronger. But you know what. I’m strong because the Lord gives me my strength. While Jerry has been in the hospital, I have been making hearts and giving them away to all the nurses and staff. I have made more than 100 hearts and I am blessed. I took them to the cancer center also and spread the hearts around there. I was blessed again. I have also given them to strangers and have had so many beautiful stories come my way. Some say when life gives you lemons, make lemonade. I say when life breaks your heart, make hearts and make people smile. You both are such an inspiration. Praying for you and your family. Thank you so much for the comment Heather. Is this Heather Hargrave? I’m so proud of you that you are such a strong woman of God. Thank you for the prayers! You’re so creative, giving, and strong mom. I admire you so much! I love you Aunt Dar! You and Uncle Jerry are in my prayers every day. ..
Drea, I’m so glad that you are following me now. It is good to know someone is out there reading it. We love you and pray for you too. We all need to get well and see each other again.